For the Love of Florida: Where Am I? Wow... it's been a while since we've played this game. Mr. Meems and I have been in and out of town a bunch lately... I've got lots of photos to share. Let's start with this from one of our day trips. This is an easy one. I thought it might be fun to occasionally post some of the random photos I've taken from my romp-abouts in Florida and then you guess where I was when I took the photo... or where the scene is that the photo represents (whichever applies). I think I am finally going to get one right, but only because I could read it on the side of the building: Harbour Master Suites at Cedar Key. What an enchanting photo, Meems. I wish that was just a day trip from where we live. 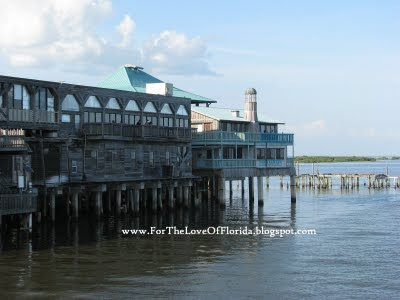 Cedar Key - for sure! Okay... Geesh... I didn't know it would be THAT EASY! You are officially correct. I had NO idea that sign had the name on it. Thank YOU for taking the time to figure it out. There are some great places down where you are, too... I'm always wishing they were day trips for me. Thank you for confirming! I know you both are familiar with that historic Florida town. Follow-up post in the works. well i had no idea but some of your readers sure got it right.